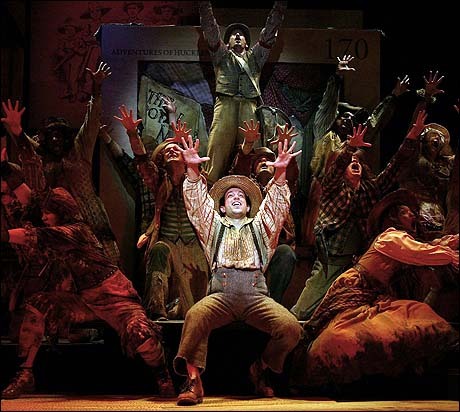 Huck (Tyrone Giordano) and company in Big River. What happens to a musical when the orchestra suddenly stops playing, the actors stop singing, and all that can be witnessed is the entire company continuing through the uplifting “Waiting for the light to Shine”, using only American sign language? The answer is that it is a breathtaking and almost transcendent experience, as it takes us by surprise in the second act of the new production of “Big River”. Bravo to director choreographer Jeff Calhoun, who knew what he was doing so that those of us that can hear would get a sampling of what theater means to those who can’t hear. Up to that point, this lively revival of the late Roger Miller (book and lyrics) and William Hauptman (book, adapted from Mark Twain’s “The Adventures of Huckleberry Finn”) musical is as much enhanced by the simultaneous signing as it is by the fine singing and performing. The arrival of “Big River, a co-production of the Roundabout Theatre Company and Deaf West Theater in association with the Mark Taper Forum, in this manner makes it more of an event than you might imagine. The 18-year-old musical probes the deeper social resonance of the rambling novel in a child pleasing way. It is chock full of social message re: moral behavior from personal lying to anti-slavery and child abuse while sharing a child’s lust for adventure. Who could be more deliberately mischievous than Tom Sawyer who would make a calamity out of any plot just for the excitement of it. Or more moral than Huck, who is constantly wrestling with his distorted conscience in which the truth is as rare and heady as a lie for the rest of us. The discovery of the moral injustice of slavery slowly dawns on him through his friendship with the runaway slave, Jim, via his constant humiliation at the mercy of every white man and boy, and there is just a soupcon of adolescent sexuality between Huck and Becky in the form of a passion awakening first kiss. Roger Miller’s lilting score, an infectious mix of country, gospel and jazz with its descriptive lyrics and easy rhymes proves accessible for sign language. Although the pleasantly twangy score never really aligned itself with the text some of the satire and sagacity of the source, it does manage to come through mainly due to the terrific cast of both hearing and hearing-impaired. With the amount of robust signing going on, there is little need for traditional choreography. However the sign language, especially when elongated to accommodate the musical phrasing and performed in unison by the chorus, takes on a memorable choreography of its own. Tyrone Giordano plays Huck with an unforced naturalism that is matched by the terrific Daniel Jenkins (he played Huck on Broadway in 1985) who gives Huck his voice. The multi-talented (check out the banjo) Jenkins also plays Twain as a narrator on the sidelines. Michael McElroy plays and sings the role of Jim the runaway slave. His striking good looks, stature and magnificent baritone voice add considerable dramatic weight to the production. These are but two of the 18 actors who, either able to speak or not, revitalize a show that seemed destined to just meander down the Mississippi. Ray Klausen’s simple set design makes the most of flats covered with Twain’s text and some flashy effects of fog, rain and stars. At the curtain calls a group of audience members scattered throughout the house stood and shook their hands in the air – the deaf sign for applause – ; it was fascinating to see so many in the audience so identified, but one still feels how blessed it was to hear the melodic score, so infectiously sung and played by Steven Landau’s six piece band. Lindsey Ferrentino’s second play starts as a comic vaudeville but become a moving account of a young woman with Down syndrome and her two older siblings.